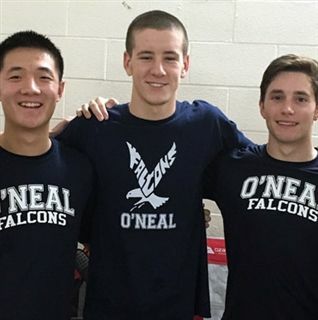 O'Neal girls and boys swim teams showed very strong on Saturday, January 21st at The Moore County Invitational, Pilot Cup. Falcon girls team came in first place and the boys team came in second place vs. Moore County area high schools in a closely contested Cup. O'Neal was second in combined results. O'Neal's seniors Bridge Hu, Hans Johnson and Kyle McClelland were recognized.